Kirby's Dream Course was one of the games I briefly enjoyed on the Super Nintendo. It was a bit too tough for me as a kid, but its release on the Virtual Console prompted me to finally master the game. In doing so, I gained a newfound adoration for its masterful mechanics and stage designs. And sometimes it's just nice to replay past favorites: though I've rolled through Super Mario World and Super Mario 64 countless times, the convenience of having them in the same box was too tempting to pass up. The VC is also a great way to try the niche hits of bygone eras: Super Turrican and Blaster Master highlight a handful of my best VC discoveries. And a few of the VC's best titles were previously unavailable in the USA, including Sin & Punishment, Castlevania: Rondo of Blood, Monster World IV, and the Japanese Super Mario Bros. 2 (localized as The Lost Levels). With over 400 titles currently available in the US, it's a good bet that at least a few of your own retro favorites are represented, and plenty of great games you might have missed are waiting. ...but Nintendo abandoned the VC service long before its library was full. Sega and Hudson supported the VC more earnestly than Nintendo. While you can easily name Nintendo-published games that should by all rights be available on the Virtual Console, you might have a tougher time doing the same for Sega's Master System and Genesis consoles, as well as Hudson's TurboGrafx-16. Fewer than 20 of the Virtual Console's 73 Super Nintendo games are Nintendo-published classics, while the overwhelming majority of Genesis's 75 games were published by Sega, and the same goes for Hudson and the 56 TG-16 titles on the VC. The dichotomy seems especially inappropriate when you look at the popularity of each system and its games. I was a Genesis kid, but even I have to face the facts that the games Sega made for it just didn't compare to Nintendo's franchises. And I didn't even know the TurboGrafx-16 existed until its games started showing up on the Virtual Console. Demand for downloadable versions of those games must have been pretty low, and yet there they were, a new game for each system practically every week. All the while, Nintendo trickled out SNES games at a sluggish pace and sat on some of its biggest hits. Even today on Nintendo's own hardware, Sega still does what Nintendon't. VC games occasionally got unexpected alterations. Look closely at the Wave Race 64 screenshot above. Anything about it seem...prophetic? Check the background: how does a 1996 Nintendo 64 launch title have in-game advertisements for a console launched ten years later? In the VC update, Nintendo decided to remove all in-game product placement for expired licensing deals (including Kawasaki and Fanta) and replaced them with ads for Wii and Nintendo DS. Corporate editing wasn’t the only VC tampering going on: photography safari game Pokemon Snap was modified to allow players to save their in-game photos to the Wii Message Board, where the snapshots could be sent to friends. And perhaps the most unexpected Virtual Console upgrade appeared in Super Street Fighter II: The New Challengers. It was the fifth version of Street Fighter II to get a VC release, but it boasted a feature completely unique* among Virtual Console games: online play. It’s hard to imagine why Capcom decided to enable online play for a single version of Street Fighter II released in Wii's twilight: had it been done earlier, it might have set a precedent for more online-enabled VC re-releases. *A few VC games in Japan also had online play options, but SSF2 is the only such game in North America. WiiConnect24 was supposed to download things for you automatically. It didn't. One of Wii’s many pre-launch buzzwords was WiiConnect24, an opt-in function that allowed your Wii to stay connected to the internet even while shut down. Nintendo CEO Satoru Iwata gave an example where the Wii system would download demos and other downloadable content overnight, automatically, to be immediately available for the player next time they powered on the system. In practice, WiiConnect24 was a rarely utilized advertisement pusher and little else. More often than not, when my Wii’s disc drive started glowing blue, I booted it and was presented with a reminder that Super Mario Galaxy is coming out in a few weeks, or that I needed a system update. In the end, WiiConnect24 wasn’t worth the extra electricty consumption. Ironically, Wii's online services benefited when Electronic Arts threw its weight around. EA’s efforts to create its own company-specific online networks are usually met with revile. I know logging into my EA Account to play NHL games on PlayStation 3 always seemed like a redundant hassle, and nobody seems to care for the company’s Origin digital distribution storefront as anything more than obligatory competition for Steam. But EA’s insistence on having its way actually resulted in improvements for the Wii’s online and digital distribution offerings. Rock Band 2’s Wii version was one of the first Wii games to support streaming content from an SD Card in order to play its downloadable songs. Boom Blox Bash Party fully supported online sharing of user-created stages (once they passed EA’s review system), one of very few Wii games to do so. It was also the first online-enabled game to do away with Friend Codes entirely: those EA Account online IDs that seemed pointless on PS3 and 360 were lifesavers on Wii, finally giving Wii users names instead of numbers and a cross-game account that worked with other EA titles. It was one of several reasons that qualified “The Worst Company in America” in the discussion of Wii’s best third-party publisher. Once the WiiWare section of the Shop Channel launched in May 2008, it had a steady supply of original downloadable games for the next few years. The shop updated at noon every Monday (later changed to Thursday) with the newest batch, and for much of 2009 and 2010 it included multiple WiiWare games per week to make up for slowing Virtual Console support. It would have been a slow drip of budget-friendly software if the bulk of it wasn't just as bad as Wii's disc-based shelf junk. Xbox Live Arcade and PlayStation Network often went weeks without a new downloadable game, but when a game did drop, it was usually worth checking out. On the other hand, Nintendo Download press releases all too often wasted words on budget shovelware like Let's Create! Pottery, My Little Baby, Spot the Differences!, and even one of those pointless fireplace displays for setting the mood at terrible parties. For all the criticism Apple and Google rightfully receive for enabling utter crap, copyright infringement, blatant clones in their app stores, Nintendo wasn't exactly the arbiter of quality on its Shop Channel, either. You may have heard of a little game called Super Meat Boy that took Xbox Live Arcade by storm a few years ago. What was XBLA's shining jewel could have been WiiWare's, as the game was originally announced as a WiiWare console exclusive. As development progressed and Team Meat built the game into the extravaganza it would eventually be, it quickly outstripped WiiWare's tiny 40 megabyte maximum size. Nintendo wouldn't budge on the limit and Team Meat didn't want to compress and cut game content, so the spoils went to Microsoft. It wasn't the only big WiiWare title to miss the boat, and one company seemed to excel in unkept promises. Nicalis, a publisher that primarily ports indie games across platforms, announced three strong sidescrolling platformers early in WiiWare's existence: Cave Story, NightSky, and La-Mulana. Cave Story was a few years late, but it did hit WiiWare in 2010. La-Mulana was even tardier, only just making it to WiiWare a few months ago. NightSky has launched on PC, Mac, Linux, and even 3DSWare, but never WiiWare. It wasn't alone: the headlines wrote themselves for the cancellations of Bonk: Brink of Extinction and Animales de la Muerte. Whether due to size limitations or WiiWare's invisibility, projects that had plenty of buzz dropped like flies as the service's relevance faded. ...but WiiWare did pretty well, despite its limits. To linger on what WiiWare lost would be a mistake, because what it got was far from bad. The downloadable service had a decent launch with short-but-sweet puzzle platformer LostWinds. It soon became a home for episodic point-and-click adventures with solid properties like Homestar Runner and Monkey Island. It had tons of experimental puzzle games worth checking out, such as Nintendo's Art Style series and a collection of melon-sratchers with weird titles like MaBoShi's Arcade and Pop 'Em Drop 'Em SameGame. WiiWare even had its own running brands: the Bit.Trip series is a system favorite (not ours, though), Konami had an entire line "ReBirths" for its action franchises like Castlevania and Gradius, and Capcom ported its Ace Attorney trilogy from the DS. And some of my favorite games on Wii were budget downloads, including solid exclusives like Fluidity and MotoHeroz. Much like the Wii's physical library, WiiWare's virtual shelves were stocked wall-to-wall with garbage, but Nintendo's first swing at digital distribution didn't lack for good game experiences at great values if you knew where to look. 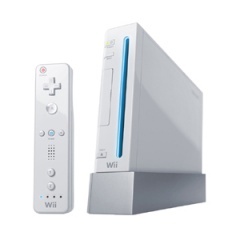 You wouldn't have known it from the marketing priorities, but Wii's digital distribution services were a substantial supplement to the Wii's DVD-based software. Did you dip into the VC or WiiWare? Recommend some Shop Channel favorites in the comments, and come back tomorrow for our Wii Truths Week finale.